Two SSS officers, Owolabi Kolawole (25) and Okunola Kayode (28) were today arraigned before Chief Magistrate Igbekele Akinyele on a two-count charge of conspiracy and armed robbery. The two SSS operatives were accused of robbing a car dealer, Peter Charles Denis of N480,000 around June 14, 2012 at about 11.30 a.m. at UBA on Owo/Ado Road, Akure. On Arraignment, the accused pleaded not guilty. One of them, Kolawole claimed that they went to arrest the complainant, Denis, and he gave them N100,000 so that they won’t take him to their office. The Court promptly reminded him that such money amounted to bribe taking punishable by law. 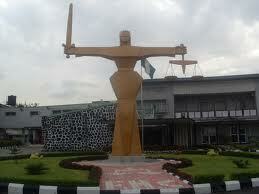 The Chief magistrate, Akinyele denied them bail and adjourned the matter to 20th July, 2012 for hearing.